This fall I’ve been studying Dutch tool chests out of both necessity and desire. I recently traded in my 10-year-old Acura RSX for a new car that has a smaller trunk, and I also had a generous offer from a reader to purchase my beat-up traveling tool chest. So I had to build a new tool chest that squeezes into my new car, holds all my tools and can be ready before the end of January. Dutch tool chests fit that bill. This is quite possibly the fastest tool chest I’ve built. After only two days in the shop, I’m about 80-percent done, and almost everything (save some long rip cuts) was done by hand. And while that time might sound spectacular, it’s not. I’ve spent almost 40 hours researching old Dutch chests and designing mine to fit a complete set of Western tools in the smallest space possible. It fits a standard set of bench planes (fore, try and smoother), all the joinery planes (plow, rabbet, shoulder, routers), a half set of hollows and rounds (plus the support planes and beaders), three joinery saws (dovetail, carcase and tenon), and all the assorted small tools, from chisels to awls to hammers. It really is quite ingenious. The other cool thing? The chest’s design uses all dimensional pine – 1x12s and 1x8s for the most part. So you can build this chest using home-center materials. If all this sounds interesting, make sure to renew your subscription to Popular Woodworking Magazine because the editors purchased an article on this tool chest for an issue in 2013. The chest will use strap hinges that can be purchased from Lee Valley, or from a blacksmith. I’ve asked blacksmith John Switzer at Black Bear Forge to make my strap hinges and hasp for this chest. And it will be painted, though I haven’t decided on the color. Stay tuned – more details to follow. P.S. Yes, all the screws are clocked. Great choice on the hinges, despite my comment on a previous hinge post about making some cheap ones look a little more distressed with a few well placed hammer hits I still believe work from a true blacksmith such as John Switzer is the way to go, especially when it’s for yourself and not a customer. Can’t wait to see the finished project, next you need to come up with the saddlebag box so John Hoffman can put one on his bike. Looks pretty cool. With the ratio of height to footprint, and all that iron up top, it would seem to be top heavy for a traveling tool chest. Does it get it’s own seatbelt? With a blanket in the top area, it can be shipped on its back. Photos explaining all this to come. Nice. It almost looks simple enough for the “I can do that” section. I really like that section. Was the traveling chest you sold the one you just built that was going to lead a double life as a coffee table? Also, if you add some beveled cleats to the back of that new chest and some mating ones on the wall, you would have a nice safe place to store it when not traveling. Just a thought. Finally Merry Chistmas to you and your family and thanks for hosting a blog that can go from intelligent to very silly to everywhere in-between. Keeps the brain nimble. Yup. Luckily, I have built a lot of chests and have a different one as my coffee table now. What is the source of the plans or where did you find the design? Is there a Dutch book with this kind of carpentry? Probably there will be some typical Dutch hinge to buy here: http://www.weijntjes.nl (since 1607). How old is the design your toolchest is based on? Oh man and I haven’t even finished the anarchist’s one! Wow, nice. How will the chisels be stored? If they’ll go in the top, how will you stop them from moving about and getting the blades damaged? Chisels will be in racks on the back wall. Do you know something about the history of this type of chests? Is it Dutch as in an anglising of the word Deutsch, meaning German? Or does it mean it comes from The Netherlands? I’m thinking two straps attached to the back of the chest, and then you’d have a rucksack. Then you could become an itinerant joiner. Happy holidays, and thanks for the constant window into your world. “Ziet er goed uit” which means something like “looks pretty good” in Dutch. Where did you find informations about Dutch tool chests? Are there some original plans? As a Dutch just curious to know. There is a photo of one in “The Toolbox book” by Jim Tolpin. The book on Dutch planes and planemakers has a nice (but small) section on Dutch chests and their construction. Plus, I have collected photos and measurements from the wild, readers and auction houses. I do not know of any plans — hence my research and forthcoming article. Sort of looks like you could put a French cleat on it and hang it at about waist height – really looking forward to that article. How do you plan put this tool chest to work? Does it hang off of a wall, as suggested above? Does it sit on the floor – it seems that this would necessitate more stooping than with a top opening tool chest. Does it have a stand – I picture something with flaired legs reminding one of James Krenov. Does is sit on the floor with a small block of wood under the front to tilt it back at a very slight angle – allowing one to see into the lower shelf like at some bookstores. Also – where will the stuff normally stored in tills be placed? Moving it – lift and carry? I imagine a cleverly designed extension handle, paired with a set of fixed, back mounted casters to allow it to be wheeled in the manner of carry-on luggage. As ever, it is fascinating to observe your experiments – If you don’t like change, imagine how you will feel about obsolescence. You can use it on the bench — sawhorses seem to be the perfect height. Its base will be two oak “rot strips” plus casters, as per some originals. I think it also could hang on the wall via French cleats. These chests usually have tool racks on the back wall to hold the small stuff – plus a “small tool bin.” The rack and bin will be in the top compartment. Some (not all) of these chests incorporated a drawer for small tools. Moving it — there will be stout oak handles on the ends and casters. I’ll weigh the sucker empty and full. The shell so far is remarkably lightweight. French cleats on a Dutch chest? Yikes. I just built a traditional style chest as a gift for my brother-in-law (we exchanged presents last night). It was a fun project, maybe I should build a Dutch chest for myself now? That would make it a Belgian tool chest, I guess. I had a chance to see the lap desk on our big trip through the east coast, I spent a long while staring at it in awe. You beat me to it again. I’ve been planing on making a chest like this based on the one in Jim Toplin’s book but now that you’ve already started its gonna be another Schwarz effect and not a Homer effect, damn it. Looking forward to seeing the your research, I love seeing the work that goes into designing these tool chests, and the context for them in history. This looks like an ancestor of the familiar Gerstner machinist’s chest. The inside dimension is 25″ so it will fit a No. 8 and two standard panel saws on the lid. As to clocked screws, that means the slots are all aligned – in this case they are all parallel to the grain. This looks like the tool chest painted by Maurice Pommier visible in your post dated 26th of August 2012 except there is no horizontal board at the top. Some interesting ones in a Dutch museum, description in Dutch but I think most will be understandable with google translate. That looks like a great design, but no space for a full-sized hand saw? That’s about the only feature I don’t like about it. Obviously the design could be made wider to accommodate longer tools, though. I am curious about all the little tools that normally go in drawers or sliding trays. Seems like they would get buried. But perhaps there’s an organizational scheme for them? I usually travel with panel saws and save the full-size saws for work at home. There is enough space for the essential kit. Promise. I’ll show how the interior is outfitted in the coming days. That makes sense. Even fitting in a panel saw would be a plus. And since it looks like I’ll be building (or helping to build) tool chests for three more children, I’ll keep this design in mind. 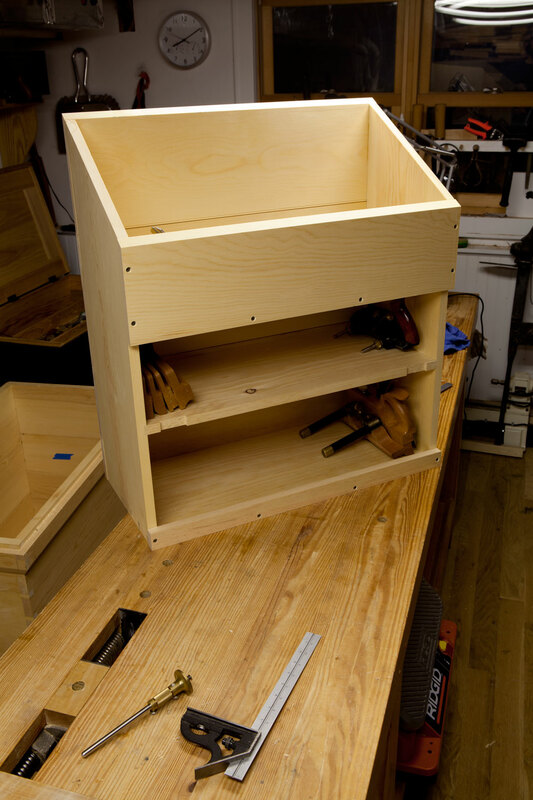 This lid will fit two panel saws – maybe three if you squeeze things in. And here I thought I was the only woodworker with an ol’ RSX (Maybe I am since this post is a year old). Great blog. I enjoy reading and living vicariously through your ww adventure.